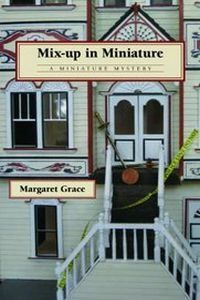 Mix-Up in Miniature by Margaret Grace: Synopsis and Online Purchase Options. Synopsis (from the publisher): Geraldine Porter is thrilled to meet bestselling author and miniatures enthusiast Varena Young. The celebrity seems to seek friendship with Gerry and her crafts group, and makes a generous offer of a house from her collection for a library fund-raiser. But Young is suddenly murdered, and Gerry is left to investigate the crime. She and her eleven-year-old granddaughter Maddie delve for information on Young's mysterious past, and they find a clue to her murder in a secret room … of a dollhouse.